Anyone who has ever played a violin or a fiddle has at some point been asked, “What’s the difference between them?” The answer is short: “Nothing.” Both names refer to the same instrument. The term “fiddle” implies more about the folk-style of music, often for dancing. The word “fiddle” refers to an instrument in the violin family, in all shapes and sizes—you might hear people refer to the largest and lowest-voiced member of the family, the “bass fiddle,” meaning the stand-up, or double bass. Today’s violin, or fiddle, is the soprano voice in the family. “Fiddle” evolved from Latin “vidula” (an early Roman stringed instrument), and appears in many languages to describe some version of a stringed instrument: the French “”vielle,” German “Fiedel,” Norwegian “fele,” Spanish, “vihuela de arco,” and Middle English “ffythele,” for example. Ancient fiddles morphed into the medieval viol, the rebec, the Welsh crwth, and even the hurdy-gurdy. Exactly when the fiddle also became known as a violin (from “vielle,” or “viol,” or “violon”) is unclear, but the terms have been used interchangeably for centuries. In Scotland, the fiddle became a popular instrument at the beginning of the 18th century. The first published collections of music for violin in Scotland were often song tunes with instrumental variations, where the violin was an alternative to the flute or oboe. Fiddlers in Scotland (and everywhere) were at the center of town and village life—most places had at least one fiddler who played for weddings, dances, and special occasions. Chieftains and lairds often had a fiddler as part of their household, and as patrons, were important in encouraging and preserving the music of 18th- and 19th-century Scotland. The Scottish fiddler’s musical repertoire is vast. It spans almost three centuries, and includes concert music meant for listening, such as slow airs and strathspeys; music for community work, such as waulking songs (vocal music to accompany fulling of cloth); marches; and of course, the irresistibly rhythmic reels, jigs, hornpipes, strathspeys, and waltzes for dancing. For centuries, the bagpipes, harp, and fiddle were the core traditional instruments in Scotland. However, following the 1745 Rising, the English proscription that forbade wearing kilts also forbade the playing of bagpipes. For social events, the fiddle took the place of the bagpipes for many years. Many of the musical ornaments commonly heard in Scottish fiddle music hark back to the bagpipes. Although in the Lowlands of Scotland, in the region around Edinburgh, Dundee, and Aberdeen, much Scottish music was written down and published in the 18th and 19th centuries, in the Western Highlands, it was still very much an oral tradition. Tunes for harp, pipes, and fiddle were passed on from one fiddler to another, learned by ear. The late 18th and early 19th centuries were a fertile time for fiddle music collections, including those of Robert Bremner, Captain Simon Fraser, Robert Mackintosh, Niel Gow, and William Marshall. Their collections included many of their own compositions, and also some from the Highland regions. Scotland had a close relationship with Europe, particularly with France, and this influence appeared most prominently in the Lowland and Northeastern regions of Scotland. Violin making, influenced by European connections, was a respected occupation, and there were several good violin makers in Edinburgh and Aberdeen in the 19th century. Scottish fiddle players in the late 18th and 19th centuries were often taught by classically trained violinists, and their styles, particularly in concert performances, reflected the classical techniques that they had learned, and that they passed on to their students. 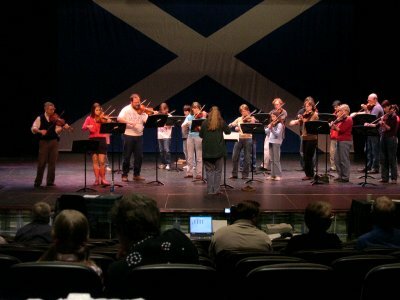 For dance, however, Scottish fiddling differs from a classical approach. Vibrato is considered an ornament, to be used sparingly. Bowing is highly rhythmic, providing an undercurrent that can be almost percussive at times. Jigs (6/8 time) are light and fast, and slightly syncopated. The Scottish strathspey (4/4 time) is a unique type of tune not found in other musical cultures—powerful, emotional, surging, and bowing is key to playing it well. For the Scottish fiddler playing for dancers, rhythm, phrasing, ornamentation, and accents are all geared to the dancers’ feet, and not so much a concert performance.